A tense and titanic battle is expected in the Premier title race, with reigning champions Rawdon Old Boys, 2013/14 winners Kirk Deighton Rangers, Knaresborough Celtic and Bedale Town all preparing a challenge. 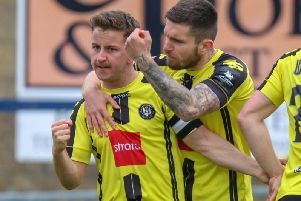 Last year’s League Cup winners Knaresborough Celtic are among the favourites to win the league championship after recruiting Brian Davey – who resigned as manager of neighbours Knaresborough Town in July. Davey and assistant Jeff Wells have outlined his intentions to grab the title away from reigning champions Rawdon Old Boys, and in doing so, have committed to developing the best junior talent in Knaresborough with a new second team. Wetherby Athletic A will be the first team to visit Thistle Hill on Saturday before newly-promoted Hampsthwaite United follow suit on Tuesday evening. Davey said: “Our aim is to create a team good enough to try and win this Harrogate Premier League. “That’s one of the reasons I took over here. They have got so many junior sides and a senior team was just going through the motions. Rangers, meanwhile, have been struck by an injury-crisis on the eve of the season with three players awaiting operations. Kirk Deighton boss Dan Marshall said: “We have had quite a turnaround of players this off-season, so this year we are going to see some of the under 18’s getting involved with the first team. Bedale entertain champions Rawdon on the opening day, and boss Steve Reed believes a range of new signings can help the club improve on last year’s near miss. Hampsthwaite will also fancy their chances after rising up from Division One with only three defeats to their name last season. However, Jono Way’s side are without a fixture on Saturday prior to facing Celtic. Elsewhere, Kirkby Malzeard survived the drop by the skin of their teeth last season, and will look to get off to a flyer under Del Chambers away to last year’s sixth-placed side Harlow Hill. Hill finished in-between Clifford and Beckwithshaw Saints last term, and the two mid-table outfits meet a Clifford on Saturday. Clifford are aiming to improve on a fifth place league finish last year with manager Matthew Wilson hopeful of a league win. “If everyone is fit I think that it is realistic,” said the boss.